Multi-Conveyor, proudly made in the USA. MULTI-CONVEYOR designs and builds standard and custom conveyors, devices and systems for all facets of packaging, food grade systems, industrial applications, material handling of most any product, and paper or converting applications - which makes us a leader in the industry for what we do. That is not an opinion or a debate, it’s simply a humble fact. Our company motto is just that... “Your best, conveyed better.” And we've proven it - time and time again. We strive earnestly to achieve that goal based on continuous technology "firsts", engineering and electrical expertise, as well as a team of some of the most qualified conveyor industry experts with decades of experience. Because of that philosophy, we have moved to a position of leadership in the industry. In addition, we take new approaches to move, handle, and orientate our customer’s products. Established in 1989, Multi-Conveyor has designed and built thousands of conveyor systems for small and large companies alike. Many are in the Fortune 500 category. They select Multi-Conveyor for our unsurpassed engineering and design team skills, our reliable high-quality products, best value, and prompt delivery schedules. For complete systems or turnkey projects, we have answers. 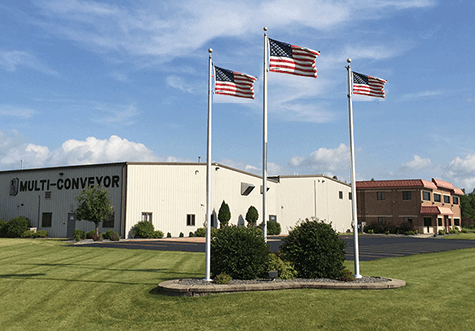 Nestled in the heartland of Winneconne, Wisconsin, our newly expanded 60,000 sq. ft. facility is where we make it all happen. We've devoted 45,000 sq. ft. solely to shop floor and manufacturing. Rapid growth called for the addition of skilled material handling designers, engineers, and project management teams. Their extensive knowledge in compatible industries expanded our product offerings. What began, for years, as conveyor manufacturing for the area's converting industry assisting paper and printing or extruding applications in the Fox Valley, Wisconsin area, has since continually expanded to packaging, automotive, beverage, bottling, craft brew, dairy, foods (frozen and fresh), household supplies, personal care, pharmaceutical (including OTC's, nutraceuticals), and various industrial conveyor applications. Strong concept and design backgrounds are what sets Multi-Conveyor personnel above the rest. We work with plant managers to solve problems throughout the entire process from the initial job drawings to the installation phase. Count on us to provide start-up assistance and depend on us to provide long term solutions for years to come. Multi-Conveyor excels in mild steel painted and stainless steel industrial conveyors, multiflex chain conveyors, plastic modular or friction belt systems, and pre-engineered quick ship conveyors. Over 45,000 sq. ft. of our facility is dedicated to manufacturing and assembly with the recent addition of 6 bridge cranes and overhead crane systems. Our manufacturing arsenal is loaded with CNC pin router, turret punch, water jet cutting system, shearing, bending, machining & turning, sandblasting, painting, and much more. Simply put, as a conveyor machine manufacturer our goal is to be the leading provider of the highest quality, most reliable yet cost-effective conveying systems and devices, while providing real value and solutions to our customer. To be on time with a superior product and a commitment to always put our customers first. We look forward to serving you soon. Click on the video to the right - you will be happy you did. Let's get working on your next project.